Café Karpershoek is the oldest pub in Amsterdam. In 1606 the Karpershoek started as a guest house for the crew of the ships of the Dutch East-Indian Company (VOC). Today, it is an authentic Amsterdam pub, well visited by both tourists and regulars, enjoying the typical Amsterdam atmosphere and the pints of lovely Heineken beer. The harbor disappeared, but Café Karpershoek remained mostly unchanged. The walls are still covered with old sayings and wisdoms, mixed with detailed wood carving and a colorful collection of pictures and paintings. When visiting Café Karpershoek, note the thin layer of sand on the floor. In earlier times visitors of the pub liked to use chewing tobacco. After chewing this sticky stuff, the tobacco was spat on the ground. Because of the sand on the floor, it was easy to clean. Nowadays, almost no one uses chewing tobacco, but the sand remains as a sign that Café Karpershoek withstood the test of time. The always busy pub is still a perfect place for a good conversation. You won't be disturbed by loud music, since there is none at Café Karpershoek. It is a typical 'talk café'. The place par excellence for a chat with real Amsterdam people. Order a drink at the bar and be served by one of the proprietors. The man who is pouring your drink has probably worked at Café Karpershoek for twenty years or more. Interested in a good story? Ask him! 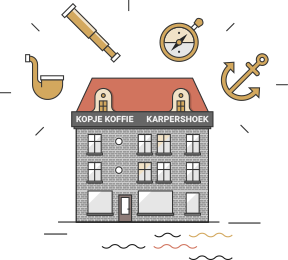 Café Karpershoek offers you the possibility to enjoy a drink or a snack in authentic Amsterdam surroundings. Or take place on the terrace by which the café is surrounded and that offers a view on the lively city life in the Martelaarsgracht and the Prins Hendrikkade. The Martelaarsgracht (Martyr's Canal) thanks its name to the criminals who once were executed here. Their hanging was done at a central place in town to serve as an example for others. In the nineteenth century the Martelaarsgracht was filled up.